I have posted regarding my permanent “word wall” using common PE language. My goal is to create a text rich environment. In addition to creating a text rich environment the text needs to relate to current physical education student learning targets. Here are some I have had success with, what are you doing to create a text rich environment, please share! Question: What are three ways you can measure the intensity of you activity? 1. Ask students to write quick reflection (i.e “What is your favorite physical activity outside of school?, Name a benefit of physical activity. 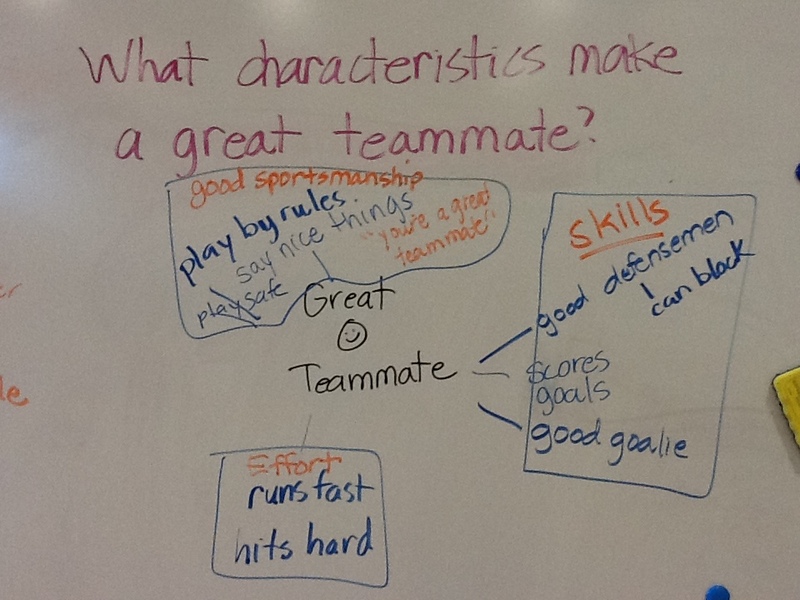 What is an example of a put-up you could give a teammate?”) These reflections can be used as a formative assessment, or be anonymous. 2. 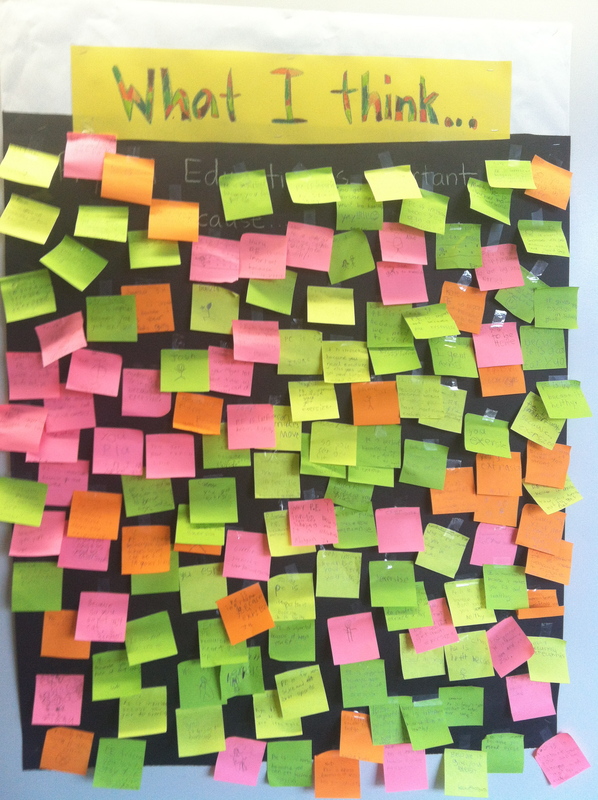 At the beginning of an instructional unit students reflect on their personal learning goal. Post these goals on a sheet, board, students could write on butcher paper. 3. As students line up at the end of class they stop and pick up pencil and sticky note. On sticky note they write one skill they want to improve, one skill they think they could teach, one skill they wish a friend would teach them. Again they can complete with name or anonymous. 4. Students carry worksheet with them from station to station. At each station they record the health related fitness component the station improves, or the skill related fitness component the station improves, or the intensity level ..) At the completion of class they could share out, turn in, take home. “When you watched your running video, what did you see? 6. 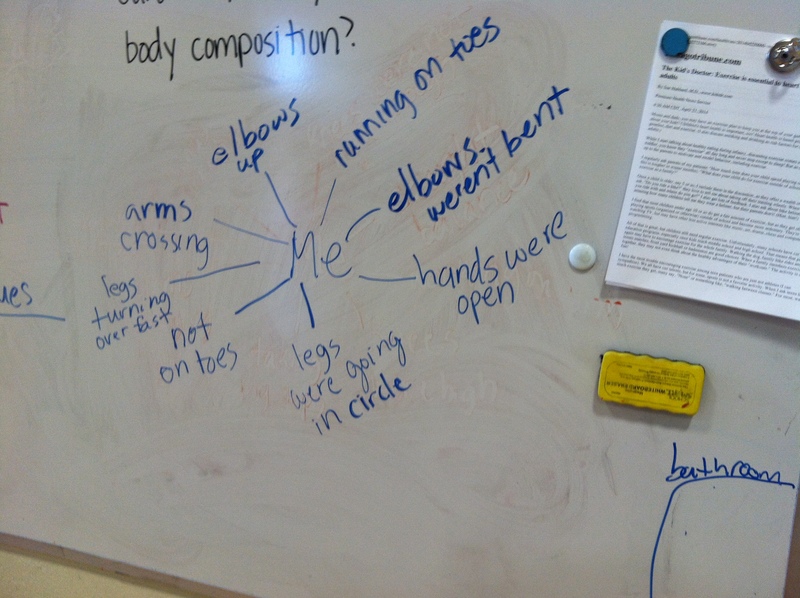 I use the white board in the gym to post daily learning targets and guiding questions. 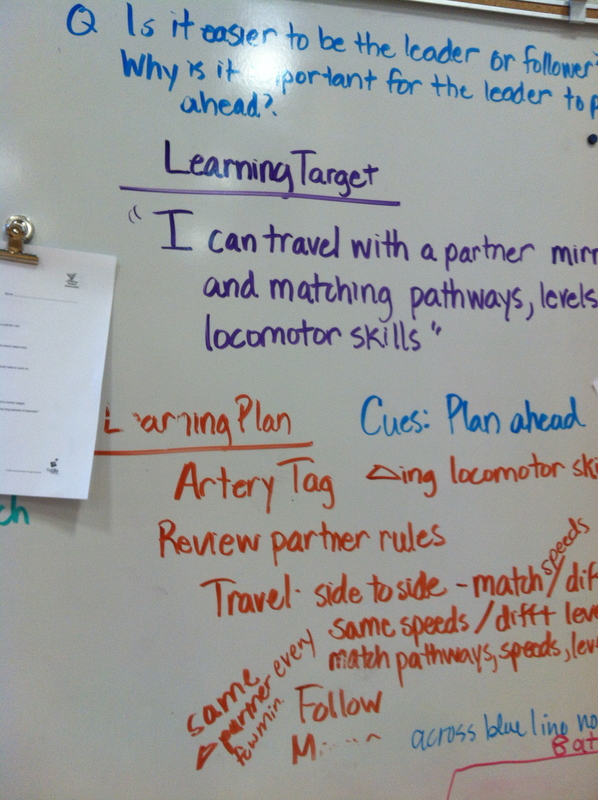 I also post a “how we’re going to get there” -learning plan. 9. Posted around the gym are instruction posters. 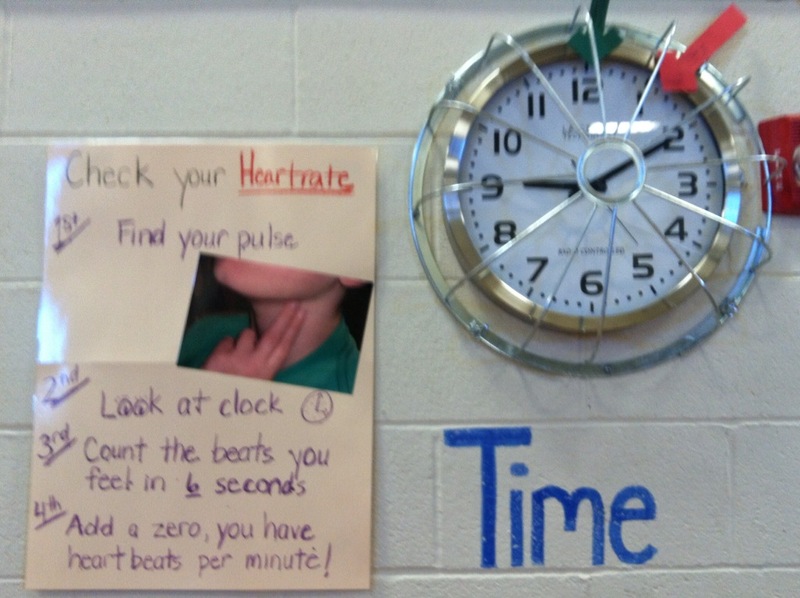 These posters give step by step instructions on how to perform common tasks like check your heart rate, set a goal,..
10. Students draw assessment cards, read the card, answer the assessment question. For example, students are participating in a tagging game. When they get tagged by a particular tagger, they come draw a card from a stack of grade level cognitive questions, bring the card to me and answer the question getting them back into the game. 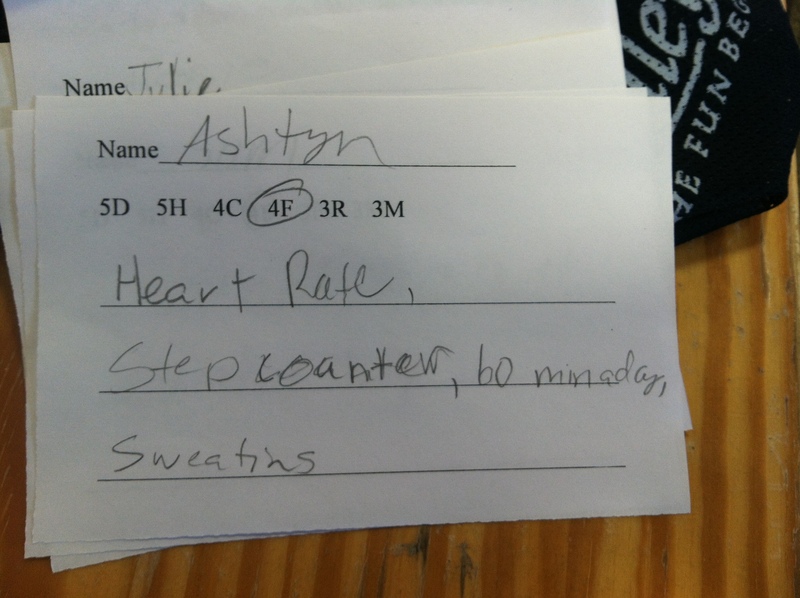 Sample questions might be “What kind of stretching should I do before an activity?, What are three ways to make my heart stronger?, What is the role of your lungs? Your friend doesn’t want to eat french fries before his soccer game, defend his stance. ….. Here is my original post on my permanent word wall. 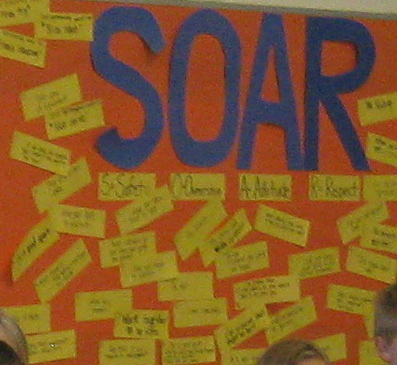 Authentic Integration can be as simple as adding a Physical Education Word Wall! Easy to create, simple to use! First of all you will need super fat markers, a list of physical education terms and a ladder. I took my list of terms from Children Moving: A Reflective Approach to Teaching Physical Education by Graham, Parker and Holt/Hale. Now you can start printing! In addition to physical education terms I also have the world record long jump measured and marked, the world record high jump measured and marked, above the drinking fountain is H2O and finally I have each wall marked directionally North, South, East, or West. I am thinking about adding clockwise and counterclockwise with arrows.